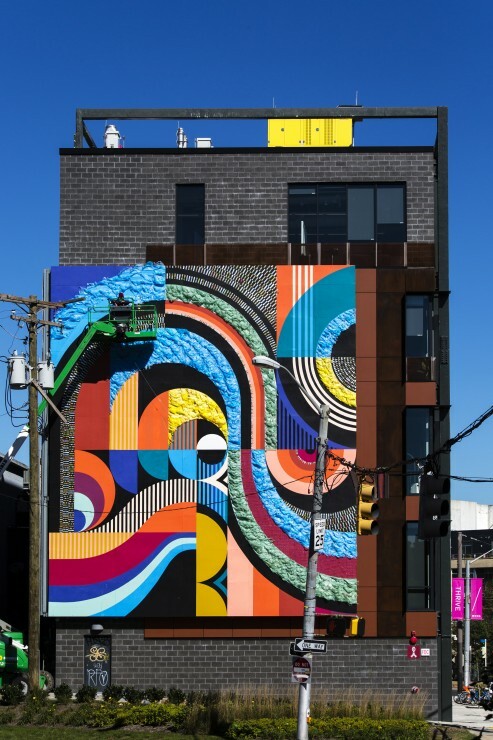 MICA commissioned Baltimore-based artist team and MICA alumna Jessie Unterhalter (‘05, MA ‘09) and Katey Truhn (’05) to install a multi-media mural on the exterior wall of the school’s new Dolphin Design Center (1401 Dolphin St.). Home to MICA's B.F.A. programs in Game Design, Product Design and Architectural Design, the building’s façade features an art screen that can be seen by everyone traveling on Howard Street. The art duo’s installation will include their signature style of painting using bold color combinations, movement and symmetry as well as newer methods, including the application of recycled materials. Their mural reflects the work that’s being done inside the Dolphin Design Center. In line with the school’s mission statement, Thrive with Baltimore, MICA is using this highly visible real estate to share stellar works of art with the community, and as an expression of the creativity that happens at MICA every day. The art screen will feature a new art installation every two to three years, and Jessie and Katey are the first artists to utilize the space. The Dolphin Design Center houses state-of-the-art fabrication labs, classrooms and collaborative areas for B.F.A. programs in Architectural Design, Game Design, Interactive Arts and Product Design as well as studio concentrations in Game Arts and Sound Art. The 25,000 square-foot building was designed by the Baltimore-based architectural firm, GWWO, with the explicit intention of creating a space for designers for the 21st Century. The Center provides the next generation of artists and designers with a dynamic facility that fosters creativity, collaboration and entrepreneurship. Game Design, Interactive Arts, Game Arts and Sound Art facilities are located on the Center's second floor, and include the Game Lab and two seminar spaces that can be opened into one large space. Product Design's flexible use space on the third floor includes individual student work spaces, a meeting area and multiple display options, including touch sensitive smart boards. The fifth floor houses Architectural Design and includes individual student work spaces, a seminar area and modular meeting area. Since 2011, Jessie and Katey have been consistently creating large-scale, public murals. The all-inclusive and socially engaging nature of creating art for the public is a driving force in their art making. Inspired by the architectural surfaces of each environment, their dynamic paintings often curve around corners and spill onto the ground. From Rochester to Russia and points in between, Jessie and Katey have been commissioned nationally and internationally to transform public spaces into playful and vibrant experiences. The two met while at MICA in 2001, forming a lasting, creative friendship and artistic collaboration. Here's what WMAR-TV 2 and the Baltimore Business Journal had to say about the new mural.